Urban Legends That Inspired "Tale of the Mothman's Return"
That was a conversation I had with a reader a few days ago, while discussing my book series, the Enoc Tales. I was conversationally explaining some pieces of real folklore and sightings that I used for inspiration in my books, things that she had never heard about before. And it's true; I make a point of incorporating as much real folklore and legend into these books as I possibly can. However, I'd hardly call the process research. Ever since I was a kid, I was fascinated by urban legends. In fact, it was that interest in local lore that got me excited about writing. in a sense, the research came first— and then the book followed. Urban Legends Are The Basis of "The Enoc Tales"
Werewolf woodcarving by Lucas Cranach, 1512. All of the books in The Enoc Tales have their roots in real legend. 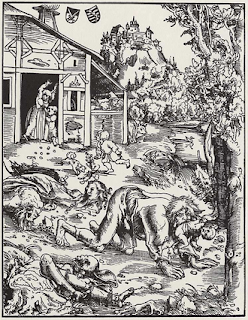 Tale of the Wisconsin Werewolf, My first novel, was written when I learned that there was a legend about werewolves near my hometown of Beloit, Wisconsin. I became immensely fascinated in the topic, and read about every sighting of the “Beast” I could find. Eventually, all of those sightings gave me the basis for a story. 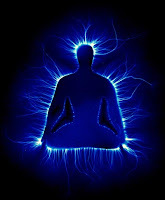 Kirlian Photograph of a person's "Aura." Likewise, Tale of the Twin-City Vampires was born from another longstanding interest of mine. You see, I'm a self proclaimed vampire nerd, and could tell you all kinds of stories about vampire folklore and more recent stories. The legend of the vampire has evolved over the centuries, and I've found that evolution fascinating. even the fictional representation of vampires has evolved subtly from one decade to the next. It seems that, in fiction, these creatures pick up new traits as each other put their own twist on it. Fictional artificial selection at its finest. So for that book, I didn't have to come up with something new; all I needed was to go back to the older tales that everybody else had forgotten. Mothman statue in Point Pleasant, WV. Which brings us to my latest project: Tale of the Mothman’s Return. It should come as no surprise to anybody that I am looking to real legends to help build the setting of this story as well. You see, there is no shortage of material when it comes to Mothman. Not everybody has heard of this particular unexplained creature, but those who have looked into it will find it's one of the most interesting and bizarre cases out there. There have been numerous documentaries about Mothman. If you are anything like me, you might thoroughly enjoy looking into this unique urban legend. 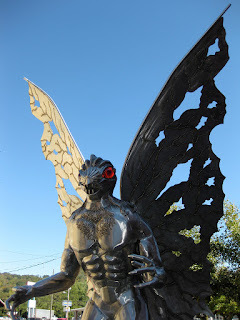 In Point Pleasant, Mothman is an idol; statues have been made in its honor, and there is even a Mothman museum. Below is one of many shows that talk about Mothman. 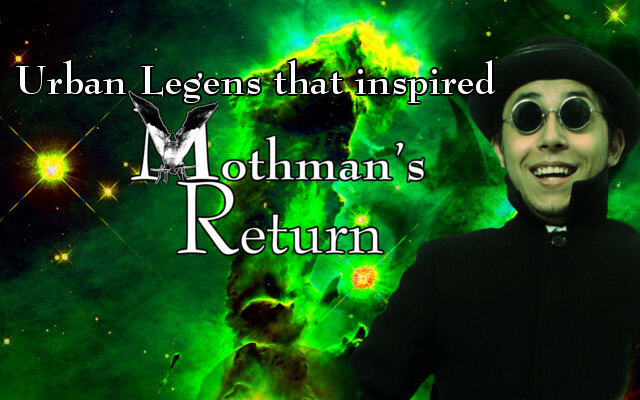 Other Urban Legends in "Mothman's Return"
Although Mothman is in the title, there are many other bits of folklore that play a major role in Tale of the Mothman’s Return. At the same time that everyone was seeing a dark, winged creature soaring the sky, there was also an unprecedented amount of UFO sightings. Many believe that the two are connected somehow, and it's not hard to imagine why. There are many different theories, but one thing is for certain; something very strange was happening in Point Pleasant in the early 60s. As if that wasn't weird enough, one of the strangest things to go on during the first phrase of Mothman sightings was neither aliens nor Mothman. People were being visited by strangers in black suits, who encouraged witnesses to keep their mouth shut about what they had seen. At first glance, this would sound like some kind of government cover up— until you pay close attention to the behavior of these men in black. They all behaved in a very strange manner, taking interest in seemingly mundane things and acting as if they had never seen them before. One became ecstatic over a ballpoint pen, while another needed instructions as to how to use utensils to eat a steak. Sightings of the men in black were so bizarre, I couldn't resist including them in this series as well. I'm really looking forward to the UFO connection.